I was inspired to create this apron design after a trip to Paris (my second favorite city!) 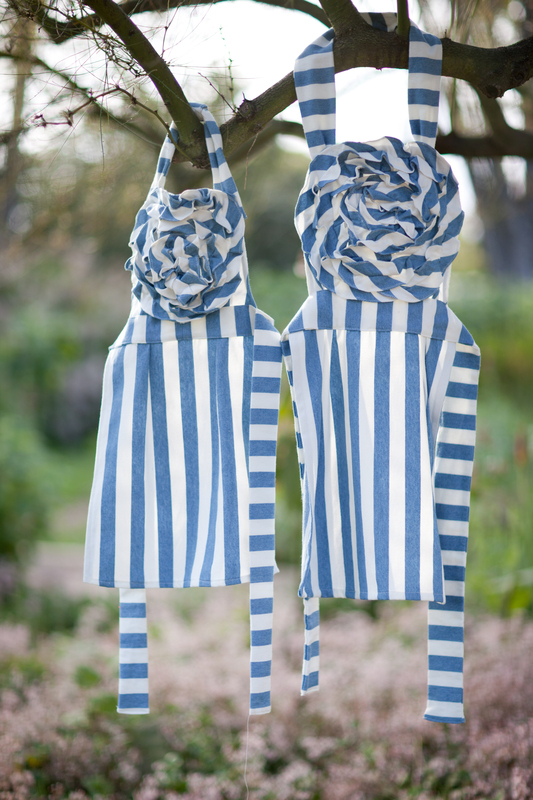 and I’m absolutely DYING for Georgiana to get big enough to wear the matching mini version. 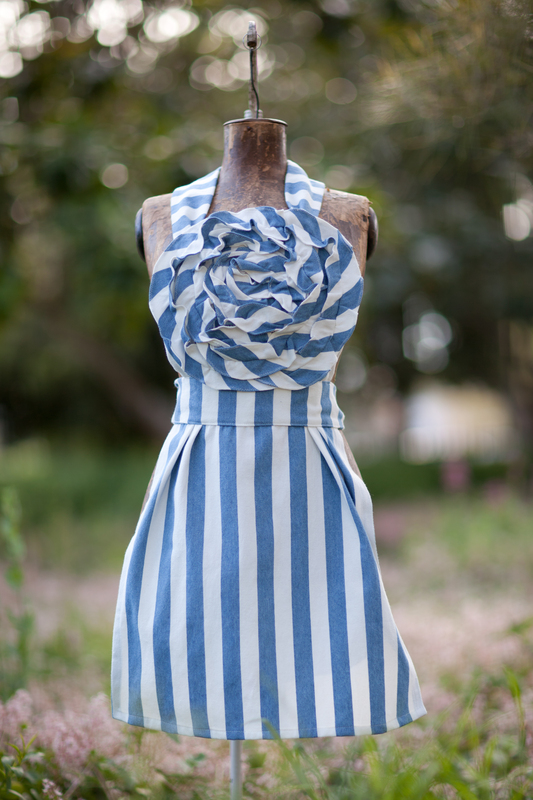 I love the idea of aprons being a fashion statement even if you’re in the kitchen with no one around. Plus, I think any husband will agree that dressing up a bit around the house even if its just throwing on a cute apron is always a good thing. Smile. Michael probably would even suggest wearing heels but that might not happen….haha! Every Christmas my very talented sister-in-law Jennifer makes these delectable cookies. She is an amazing cook and these cookies are my husbands favorite. Sometimes she makes an extra little bag to-go for us which is actually quite dangerous! I asked her for the recipe to put on the blog and it turns out she was using Ina Garten’s recipe. (Good ol’ Ina!) 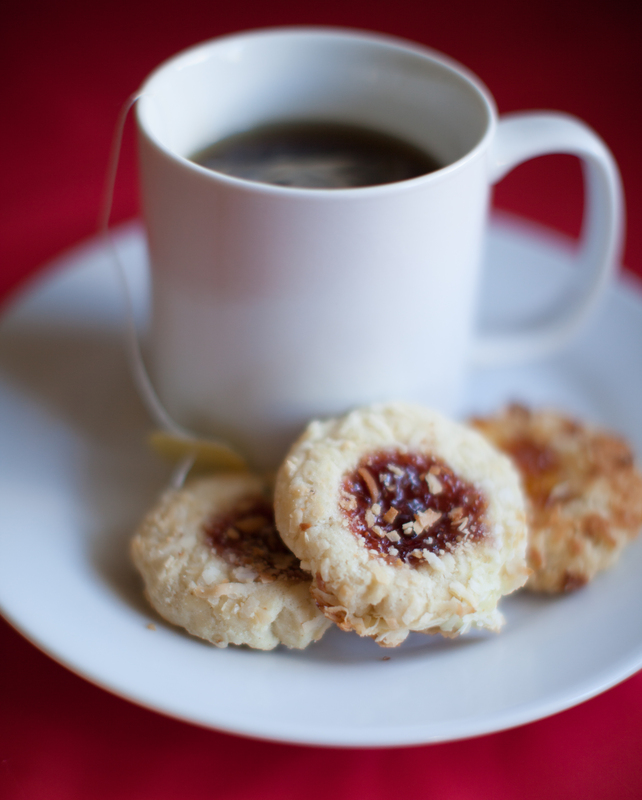 These little cookie are absolutely fabulous with a hot cup of herbal tea so snuggle up and enjoy. In an electric mixer fitted with the paddle attachment, cream together the butter and sugar until they are just combined and then add the vanilla. Separately, sift together the flour and salt. With the mixer on low speed, add the flour mixture to the creamed butter andsugar. Mix until the dough starts to come together. Dump on a floured board and roll together into a flat disk. Wrap in plastic and chill for 30 minutes. 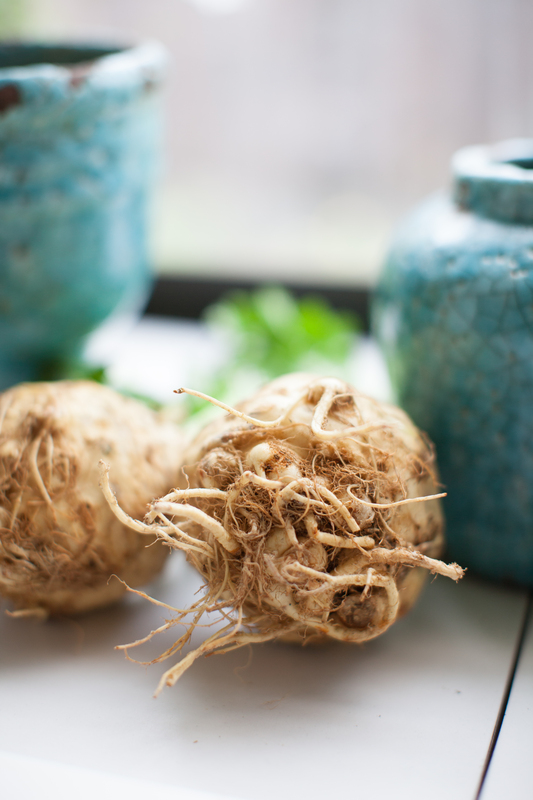 A celery root or celeriac is a very alien looking vegetable and its hard at first glance to really appreciate how tasty it is. So…if you haven’t already I recommend just coming out of your comfort zone and making this soup as your first experience. 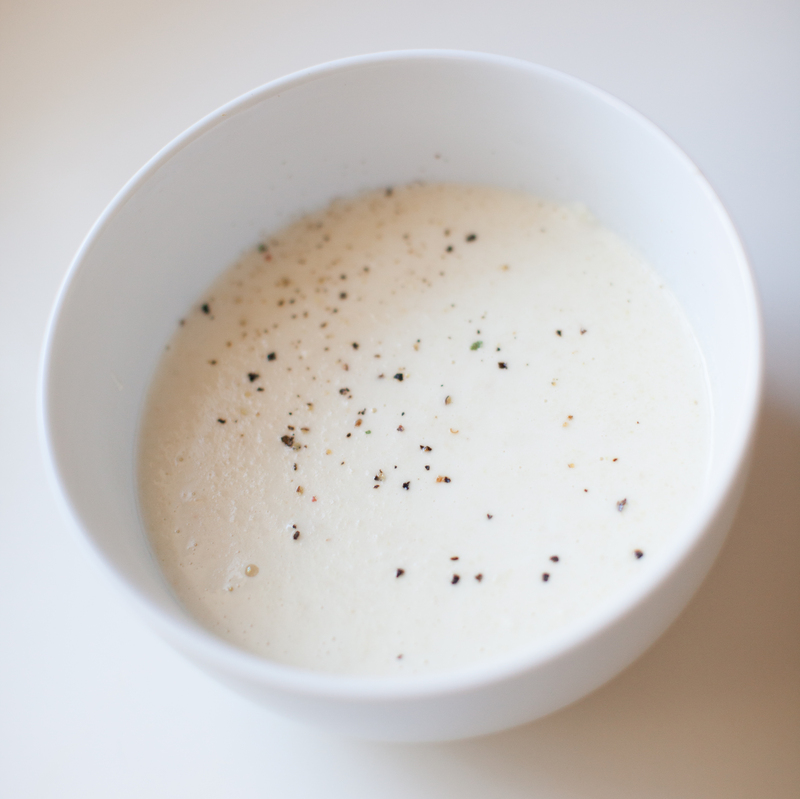 This delicious soup is a crowd pleaser and you’ll feel pride in adding a new ingredient into your repertoire of food. 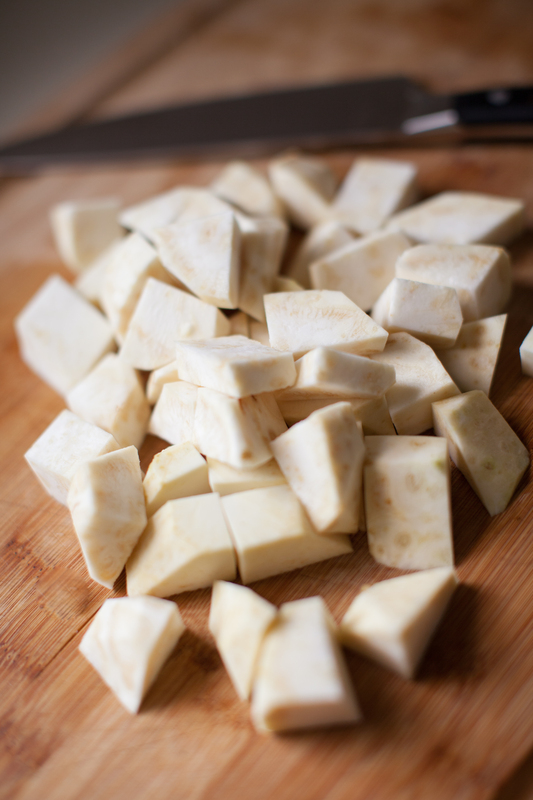 Peel and dice celery root. Saute the root in a saute pan with butter. Coast the root thoroughly with butter and let simmer for 10 minutes with cover on. Add cream, stock and sour cream. Stir until nicely combined. Simmer for 12-15 minutes unitl root is very tender. Puree mixture in batches in food processor fitted with the blade attachment. Season to with salt & pepper. Taste and correct seasoning to taste. Serve. *Note: Celery root can be very fibrous so a food mill would actually eliminate this even more than the food processor if you have one. Still great with the food processor or even a blender.